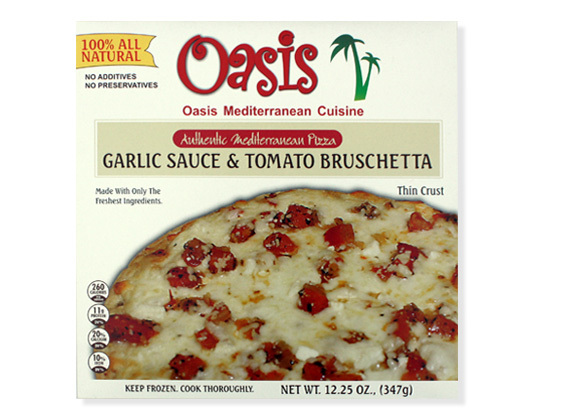 Perfect for lovers of both thin crust pizza and Oasis Bruschetta, Garlic Sauce & Tomato Bruschetta Pizza is 100 percent all natural with no additives and no preservatives. Made with an authentic Mediterranean style grain crust, this pizza is topped with only the finest ingredients including garlic sauce, our tomato bruschetta and a delicious blend of five cheeses – Mozzarella, Feta, Asiago, Romano, and Parmesan. 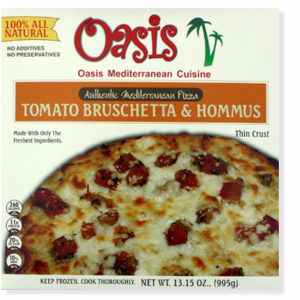 Ingredients: Crust: Wheat Flour, Water, Malted Barley, Yeast, Honey, Olive Oil, Sea Salt, Tomato Bruschetta: Fresh Tomatoes, Garlic, Onions, Basil, Oregano, Olive Oil, Sugar, Salt, Balsamic Vinegar, Cheese Mix: Mozzarella Cheese (Pasteurized Part Skim Milk, Cheese Cultures, Salt, Enzymes, and Calcium Chloride), Feta Cheese (Pasteurized Milk, Salt Cheese Culture, Enzymes, Potato Starch to Prevent Caking), Asiago Cheese (Pasteurized Cow’s Milk, Cheese Culture, Salt, Enzymes, Parmesan Cheese (Pasteurized Cow’s Milk, Cheese Culture, Salt, Enzymes, Romano Cheese (Pasteurized Cow’s Milk, Cheese Culture, Salt, Enzymes, Garlic Spread: Water, Garlic Clove, Corn Oil, Lemon Juice, Potato Flakes, Salt, Contains: Wheat, Milk. Cook Frozen. Preheat oven to 450°F. Remove Plastic. Place pizza directly on the center rack and bake for 8-12 minutes until cheese starts to brown. 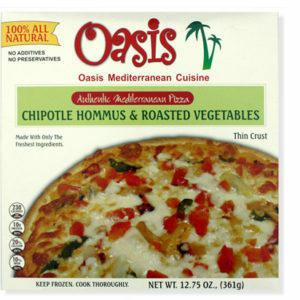 Check pizza after 8 minutes since ovens vary in temperature so you may have to adjust baking time. 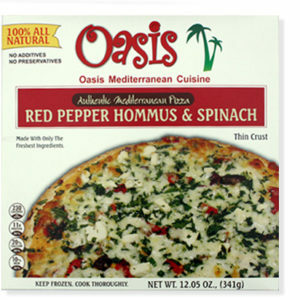 Remove pizza and let it stand 3 minutes – use caution when handling hot pizza. Cut and serve. Do not eat pizza without cooking and cook to 160°F for safety.